In the process of upgrading some ESXi hosts, I had one host that showed an error as follows. To resolve this issue, resynchronize the password with the vCenter Server database. 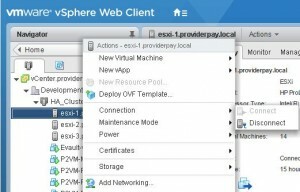 Right-click the ESXi host and click Disconnect. Reconnect the host and enter the root password when prompted. I am facing the same issue in my VMware environment with alert as “Host Connection and Power State” Is there any other way apart from disconnecting the host from Vmware environment? I don’t have the root password. I don’t think there is another way but there is a way to recover your root password. Re-install ESXi on the host and you will be able to create a new root password.